Please use our online booking form below to schedule your visit. 4) We require a £20 deposit for all bookings. You can choose to pay the full amount or just the deposit and then pay the remainder on the day of your game at our location. Please Note: We recommend an optimal team size of 4 for our games. The rooms are not very large so we don’t advise to play with larger groups in single games. If you have a larger group, we advise to split into teams of 4 and play multiple games. 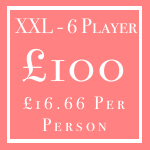 We offer a special deal of £15 per person for groups of 8 players or more. Contact us and we will be happy to help plan your event.